Aisha holds a PhD in Policy Studies in Urban Education from the University of Illinois at Chicago, a Masters of Education from DePaul University and a Bachelor of Science in Management Studies from the University of Maryland- European Division. Aisha is passionate about issues of equity, justice and education. These passions have led her to become an Illinois State Board of Education Certified K-9th grade teacher, an adjunct professor at several colleges and universities, an elected school board member for Community Consolidated School District #168 and newly appointed board member for Routledge journal, Religion and Education. Additionally, Aisha currently manages a $16M federally funded Chicago teacher preparation grant spanning across four universities in the Chicagoland area. Some of her most recent roles include Coordinating Committee Member with Teachers for Social Justice, Assistant Director of Bridging the Gap, Co-chair of Public School Initiative for Council of Islamic Organizations of Greater Chicago and Advisory Board Member serving Chicago Metropolitan Educational Center for Community Advancement. Additionally, Aisha enjoys reading, running, puzzles and family game nights. Aisha has been married for almost 13 years and has 3 amazing daughters. Ahlam Jbara was born in Palestine and immigrated with her family to Chicago in 1974. Ahlam returned to ICIRR as the Deputy Director after serving as the Interim Executive Director at the Council of Islamic Organizations of Greater Chicago (CIOGC) a 20 year old community organization that brings together the Illinois Muslim community. 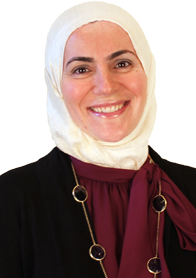 Before joining CIOGC, Ahlam was the Immigrant Family Resource Program (IFRP) Director at the Illinois Coalition for Immigrant and Refugee Rights. From 2003 – 2006 Ahlam was the Family Empowerment Program Director at the Arab American Action Network. Ahlam has worked for over 18 years on creating and administering programs that help women and children become self sufficient and independent; programs that will make change in the lives of women and children and that will empower them to use their voice and find their inner power. Additionally, she has led the voter registration and get out the vote campaigns on the southwest side in the Muslim community, has trained youth and adults on civic engagement and organizing. Ahlam sits on several other boards and committees to serve the community and especially women and children. Hesham Hassaballa is a Chicago-based physician and writer. He has written extensively on a freelance basis and has been published in newspapers across the country and around the world. He has been a Beliefnet columnist from 2001-2009, and has written for the Religion News Service. His articles have been distributed worldwide by Agence Global, and he is also a guest blogger for The Chicago Tribune. In addition, Dr. Hassaballa has appeared as a guest on WTTW (Channel 11) in Chicago, CNN, Fox News, and National Public Radio. To further educate the community about medical topics that are important to him, Dr. Hassaballa responds to patient inquiries on HealthTap, where he is a Founding Medical Expert. Such topics include emphysema, COPD, sleep disturbance, and lung cancer. Most recently, he was recognized as a Top Pulmonary/Critical Care Intensivist within Illinois. He also received the Most Influential award for his inspiring responses to patients and colleagues. Suzanne Akhras Sahloul is the founder of the Syrian American Medical Society (SAMS) Midwest Foundation, serving as president from 2004-2006. She is also one of the founders of SAMS National Foundation, serving as national chairwoman from 2005-2007. Suzanne represented the Syrian American community at the U.S. Department of State's Global Diaspora Forum in 2011 and 2013. In addition to her international work, Suzanne has been active with her children's school, the Universal School, serving as PTA president from 2009-2011 and as a board member from 2011-2013. She was the Council of Islamic Organizations of Greater Chicago (CIOGC)'s Intern/Volunteer Director from 2011-2013, and served as chairwoman in organizing the much lauded 2012 CIOGC 20th Anniversary Dinner. She has a bachelors degree in history and education from the University of Illinois in Chicago (UIC), a Masters of Arts in Organizational Leadership (MAOL) from Lewis University, and is currently pursuing a Certificate in Nonprofit Leadership at the Kellogg School of Management and a Certification in Project Management and a Certificate in Fundraising at Northwestern University. Suzanne currently resides with her husband and three children in the West suburbs and in her spare time she enjoys reading, hiking, and traveling. Ahmed Rehab is the Executive Director of CAIR-Chicago. Rehab is a regular contributor to the Chicago Tribune and Chicago Public Radio. He has been interviewed hundreds of times by newspapers, radio, and TV venues, both national and international. Rehab lectures at various University campuses in Chicago and around the nation. Prior to joining CAIR in August of 2004, Rehab was a freelance speaker, writer, and activist in the fields of interfaith collaboration, education, and community outreach. Between 1999 and 2002, Rehab served as a consultant for Arthur Andersen LLP – a global consulting firm. Rehab serves as a board member of the Illinois Coalition of Immigrant and Refugee Rights (ICIRR). He also serves on IL. Governor Pat Quinn’s Muslim Advisory Council. He is a board member and secretary of the Egyptian American Society, a member of the Chicago Council on Global Affairs’ (CCGA) Muslim task force, an Eisenhower fellow of the American Assembly, and alumnus of the FBI Citizen’s Academy.